Time to buy your Cinemalaya 2013 tickets! Posted in: 2 Shout-out-Looks, 6 The Movie Corner. Tagged: Alabang Town Center, Cinemalaya 2013, Greenbelt Cinemas, Trinoma. I’ve been reserving this spot for Cinemalaya 2013 for the past two weeks now. And since the festival will commence very soon (as in starting Friday next week), I am strongly recommending all interested cineastes out there to start buying tickets now. You can go online and visit Ticketworld for all the runs at CCP (Cultural Center of the Philippines). You can also check the box-office at Trinoma, Alabang Town Center and Greenbelt cinemas for their schedule of screenings. Below is the trailer of one of the entries in the Directors’ Showcase section – Liars by Gil M. Portes. Posted in: 2 Shout-out-Looks. Tagged: Alabang Town Center, Gelbert Aplal, Miss International 2005, Precious Lara Quigaman-Alcatraz. Miss International 2005 Precious Lara Quigaman-Alcaraz is the picture of peace and contentment as she awaits the birth of her first offspring with husband actor Marco Alcaraz. In the image above taken by my favorite photographer Gelbert Aplal, she is at peak pregnancy form. The additional weight made her look more lovely. I should know. I frequently see her and hubby strolling around Alabang Town Center on weekends. 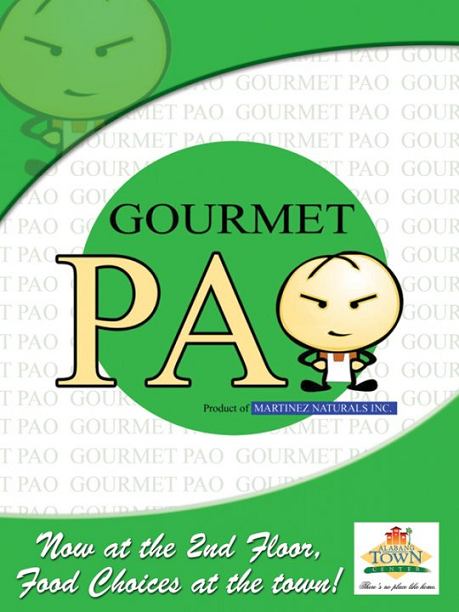 Have you eaten your Gourmet Pao today? Posted in: 2 Shout-out-Looks. Tagged: Alabang Town Center, Gourmet Pao, KC Montero, KC Pao, Mikaela Lagdameo-Martinez, Rockwell. Earlier this week, Mikaela sent a box of Gourmet Pao to my house as Christmas Gift. It had three Grandes inside and let me tell you, eating one is almost equivalent to a (burp!) full-sized meal. So what my mom and I did was to eat half and half of two flavors (Chucho and Longga Ka Day) and we’re all set for dessert afterwards. Our verdict: it was so good that we decided to check out the other variants as soon as the next craving calls. One serving of a Grande Gourmet Pao is almost like eating a full lunch or dinner. The colored dots above (which can also be seen on top of each Gourmet Pao) make it easy to identify which flavor you're eating or buying. 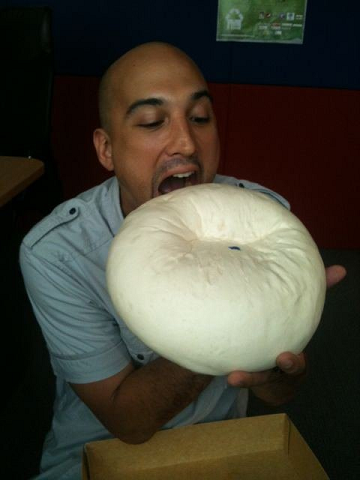 DJ/TV Host KC Montero taking a big bite out of his namesake, i.e., Gourmet Pao's biggest offering - the KC Pao! 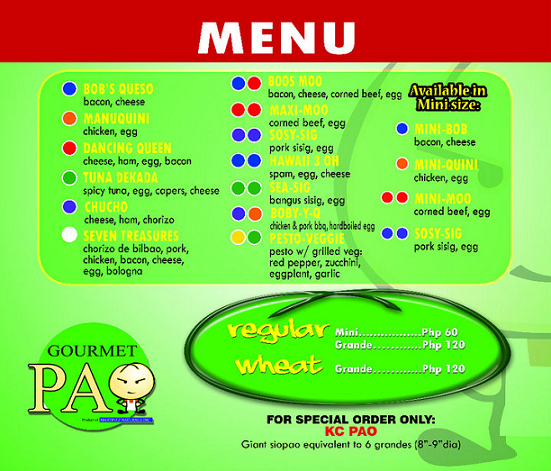 According to its Facebook page, GOURMET PAO is one of a kind. 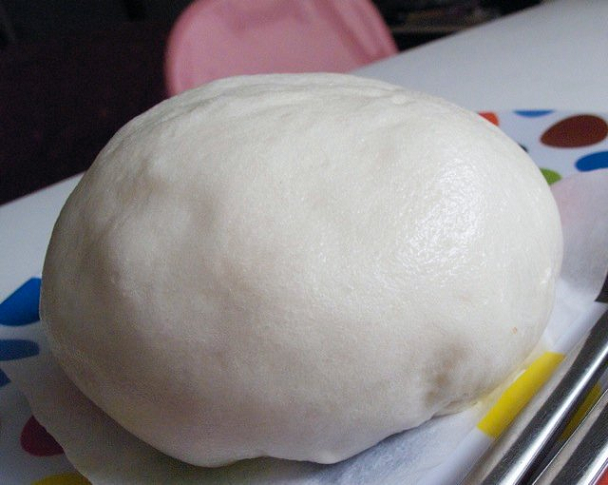 We’ve got them in both Wheat & Regular dough. That’s not all, there are 16 UNIQUE FLAVORS! Try them, and we guarantee you–you’ll keep coming back for more! WE DELIVER! 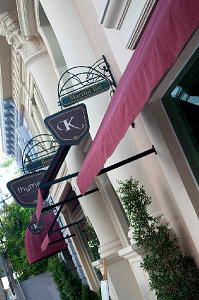 So you’re still out of the loop, head over to one of their stores – Alabang Town Center, MVY plaza Sta. Rosa, -Powerplant, Rockwell (Friday, Saturday and Sunday), -SM Fairview, -SM North Edsa, SM Mall of Asia MOA (open Dec.22), SM Megamall (open Jan17) -BF Homes, Aguirre Ave (open Jan.3). Provincial branches in Davao, Cebu, Dumaguete and John Hay (Baguio) are in the works! Posted in: 2 Shout-out-Looks. Tagged: Alabang Town Center, Cyma, D'Mall Boracay, Eastwood Mall, Greek Chicken Adobo, Greenbelt 2, Roka Pasta, Roka Salata, Shangri-la Mall, Skolatina, Terraces Ayala Center Cebu, Trinoma. Sunday is always a family day for me. It also happens to be a day of gastronomic hunting. But for the past two months now, we got stuck with Cyma. We’ve been going back and forth here and must admit that all members of the family never get tired of eating their delicious food! 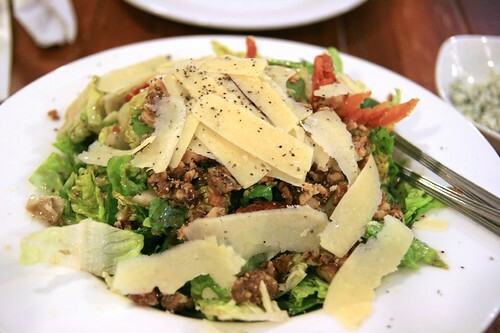 Personally, I go to Cyma whenever I’m in one of my no-mood-for-meat eating binges. Just give me a trio of solo Roka Salata, solo Roka Pasta and the sinfully-yummy Skolatina and I’m good! The glorious Roka Salata (generously topped with Blue cheese) sets up my appetite for more! 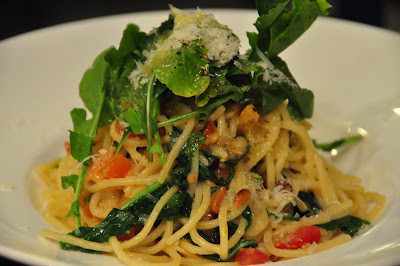 Cyma's version of the simple pasta - Roka Pasta - is a real tummy-filler without much of the calorie guilt! Cyma's version of the Chicken Adobo is so tasty! 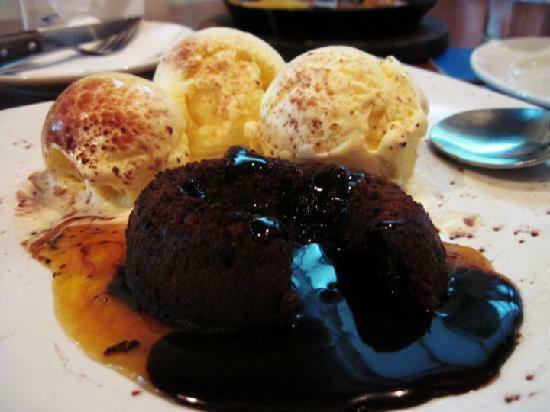 And for dessert? 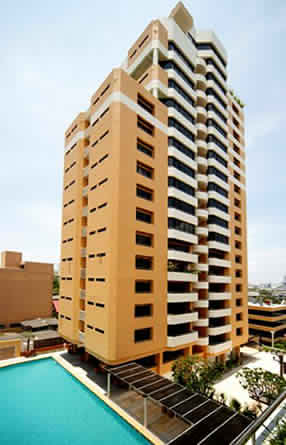 You wouldn't want to miss their decadent Skolatina! But order ahead because it takes them at least 15 minutes to prepare this 'to-die'for' creation. 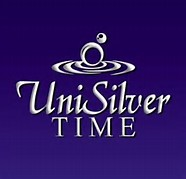 I frequent their branch at Alabang Town Center all the time because I live in the south. But you can also drop by their outlets in Greenbelt 2, Trinoma, Shangri-La Mall, Eastwood, Boracay (D’Mall), and at the Terraces in Ayala Center Cebu. 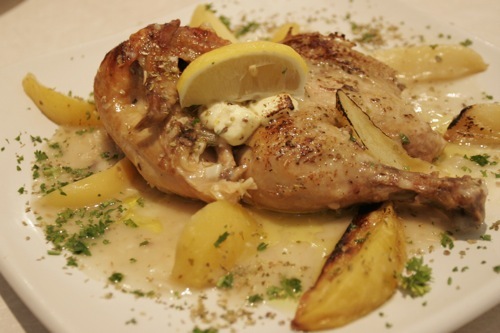 If you want to further check out their menu, visit Cyma’s website.